Every now and then you read a book and wish you had about a hundred of them to give away to people who should be exposed to the insight contained within. “Baked In” is exactly that kind of book. Every now and then you read a book and wish you had about a hundred of them to give away to people who should be exposed to the insight contained within. Baked In is exactly that kind of book. In fact this book is such a recipe for future success that you should definitely try one, either with or with out a sprinkle of skepticism. An abject lesson in rethinking your approach to branding and product design that will leave you well satisfied with insight. Step One; A healthy dose of walking the talk. A couple of advertising guys explain, in crisp sentences and snappy stories, what it means to do without advertising. That’s right, they courageously take their own advice and embrace self-annihilation, in an effort to stay fresh and do for themselves what they do for clients. The book suggests the destruction of typical approaches to the creation and marketing of products. Interested? It gets better with step two. 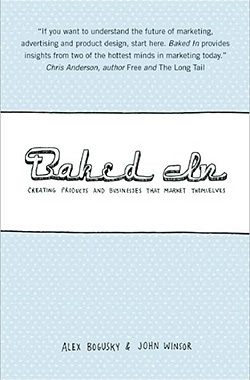 Baked In presents, as role models, 28 rules and behaviors of companies doing it the right way according to the authors. The right way means no less than industrial design in goods and design thinking in services being the ultimate tools for marketplace success ahead of every other. Although we have all sampled many of these stories before, in Baked In, Bogusky and Winsor manage to find ways of storytelling that keeps them fresh and infuse the book with page turning anticipation for anyone remotely attached to the field. In addition, if you are passionate about design, there is a “dang it” aspect to the page turning because this is the book we had all hoped to see some day, and advertising guys did it. Okay, maybe the most creative and edgy ad guys in the world, but still, should have been a designer don’t cha think? Step Three; Mix in a little flag waving. From the consistent focus throughout this read on simplicity, sustainability and efficiency of products and services whose marketing is “baked in”, to the final section of the book, part three, which is a bold manifesto on the future of everything, this is a book that has a point of view and is not shy about expressing it. The lessons and examples are told with respect but clearly point to a dramatic conclusion; The idea that these insights are not only an imperative but also key to the future of pretty much everything from the economy to the environment. Finally, Step 4; Beautifully Plate, leaving some white space. This is a small quick read that is at the same time a meaningful peak under the kimono of Crispin Porter + Bogusky. An exclusive reveal of the thinking and techniques that caused the meteoric rise and growth of this hugely successful creative powerhouse. The firm by the way, that holds a business interest in both Yves Behar’s extremely successful consultancy FuseProject, as well as noted designer Bruce Mau’s company. Experiences from both companies are artfully weaved into the narrative. In the end, the brief quality of the book is much appreciated, leaving one with the feeling that there is much more to come. Social networking for example is only briefly touched upon, perhaps the connection made between the book and its Twitter community will reveal another volume of sharing. The authors are clearly not done here and I for one don’t want them to be. This is one of the nicer experiences in reading I’ve had in quite a while. Not everything needs to be 500 pages. At just over 150 pages of fun, sometimes rich, sometimes lighthearted insight, I exited this experience with a great many new thoughts, a dash of self-knowledge, and just bit of room for more that I hope will one day come.